Guess How Much Cheaper Homemade Coffee Is? Making coffee at home is a huge money saver compared to buying it at Starbucks or another coffee shop. But JUST how much cheaper is it, really? And how much do those savings grow into if you invested it? We crunch the numbers so you don’t have to! 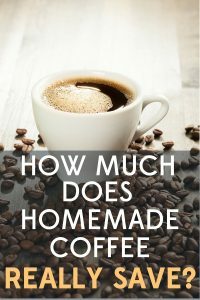 How much cheaper is homemade coffee? A medium cup of regular coffee costs $2.40 in my neck of the woods. I know it’s cheaper at McDonald’s, Dunkin Donuts, and other fast food joints, but I’ve drunk coffee from those restaurants, and it’s not an experience I’d like to repeat. So call me a coffee snob. I can live with it. How much does it cost to make coffee at home? I use two tablespoons for each large cup of coffee. So that $14 pound bag of coffee beans makes me 50 CUPS OF COFFEE at a cost of $.28 per cup ($14/50 cups = $.28 cents). I bought this stainless steel french press years ago on Amazon. I highly recommend it if you’re in the market. It’s stainless steel so it never gets too hot to the touch and it has a double layer so it insulates my coffee really well, keeping it hot a very long time, as long as the lid is on. The only downside to this particular french press is that it only makes 24 oz of coffee at at a time, so not ideal for parties. And, of course, a standard coffee maker is going to be a whole lot cheaper! I’ve owned my stainless steel french press for 9 years and I paid $45 for it. So that means an additional $5 per year for the cost of my at home coffee habit. That’s less than the cost of two cups of coffee bought at a coffee shop, so basically negligible. What are the yearly savings from drinking coffee at home? I drink a cup of coffee most days and I drink a lot less coffee than other coffee drinkers. So let’s do the math as if I had one cup of coffee every day. Making my coffee at home for one year adds up to $.28 x 365 days = $102.20. Or, $8.52 per month. Buying coffee once a day for one year adds up to $2.40 x 365 = $876. Or, $73 per month. Making coffee at home every day saves me $773.80 per year. That is a savings of $64.48 per month. Say you put those savings into a basic mutual fund and each month added an additional $64.48 that you saved making homemade coffee. How much would that turn into over ten years? If the mutual fund average earnings of 6.50% interest and you compounded whatever you made (which means buying more mutual funds with the dividends), that measly $64.48 would grow into $10,981.93. Did you realize drinking Starbucks was costing you $10,000? I certainly didn’t! But the cost of a daily habit adds up quick. I shudder to think of those with latte habits! Save a little every month on coffee or another item you can make or do with out, and you’ll end up with a lot more money in the long run. I mean $10,000 is nothing to sneeze at. And compounded with savings in other parts of your life, you’re on your way to paying down your debt, or saving for retirement, or saving for a home…whatever you savings goal is! Don’t think of it as a privation. Think of it as MAKING MONEY. Because that is truly what you are doing. You are making savvy financial lifestyle decisions that are leading you to wealth. Saving money is making money, right? Little steps mean big money down the road. @Travis So true! And sometimes it’s a good excuse to take a break from work or chat with a co-worker. 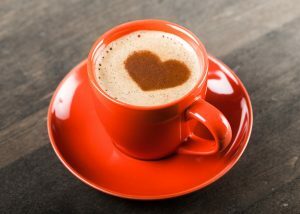 Believe me, I enjoy Starbucks coffee as much as the next person, but now that I know how cheaply I can make delicious coffee at home, I don’t plan on buying coffee as often. For me, Starbucks is a weekly treat, when I have to get somewhere and don’t have time to go home and brew a cup. Or after church on Sundays, when I can relax and peruse the Sunday paper. @Betnich Sounds like buying coffee is part of your routine and that you’ve figured it into your budget and use tricks to save. Have you ever bought Starbucks gift cards at a discount? I buy a bunch of different gift cards to the stores I shop at most frequently (CVS,Home Depot, Marshalls, etc) at Carpool. Here’s a link! Any time you have someone else prepare stuff for you, it’s probably going to be more expensive. I did some algebra on the McDonald’s menu and the egg for the breakfast sandwich is costing you $2.09 for the egg. People at my work just have a communal coffee pot. People on the list just bring in coffee on rotation. Guests can pay $.25. @Bryan Logan Nice System! The cost of the food is usually pretty low when buying prepared stuff, but labor adds a lot to it. You can make almost anything at home, even fancy dishes like Shrimp Scampi, for a fraction of what it would cost in a restaurant! I’m with you 100 percent on this one. I stop at Starbucks about once a month to buy a 5lb bullet of beans, which I grind at home. I take a 32oz with me in my Stanley every morning, my wife gets her 3-cups-a-day from what’s left in the brewer. By limiting my Starbucks visits to one per month, I pretty much eliminate any temptation to splurge on the expensive latte. One observation one the article; coffee from McDonald’s or 7-11 or AM PM is cheap coffee at any price, and that’s expensive. Starbucks coffee brewed at home is an inexpensive way to enjoy quality coffee. @Steve Ditto! I’ve thought about grinding beans at home, but I’m happy with the taste of already ground beans and usually go through a bag in about 3-4 weeks. (When I’m sick I don’t drink coffee, just tea.) I don’t want another small appliance in my kitchen and it saves time to buy it ground up for my french press. Yes, agreed! Even “cheap” coffee is expensive compared to what you can make at home! @CC Wow! That is a LOT of money for a coffee maker. SOunds like it’s pretty special, though, and with both you and your husband drinking so much, I can see how it makes sense. Enjoy amortizing that Delonghi espresso maker with every cup you drink! I make my coffee at home (use my grinder & beans) and I probably go out for coffee on the weekends (3-4x a month) Had a friend who used to go to the coffee house 2x a day..until she realized how much money she was going through, it adds up quickly. Hey, whatever feels comfortable for you, its your own money. @Di It’s so true that when you really look at specific numbers about spending, it helps you scale back, change habits, and save more money in the long run. It’s why I’m such a fun of crunching the numbers!!! I am a certified coffee addict and I can’t live a day without it. lol 🙂 I think making your own at home is a great way to save. You won’t be able to do it every time but doing it frequently than going to Starbucks and have your own coffee is really advisable. There’s so much to explore in the coffee machines segment that it’s surprising. And that being said, all this doesn’t come at a ridiculously high price. These coffee makers are utterly reliable and affordable. But this isn’t reason enough to buy coffee makers. I am not a fan of cheap coffee, and I much prefer a decent espresso if they made right. I have been making espresso for years in my family coffee shop and I assure you, its easy to tell cheap from expensive. Wow this is very interesting information. I will consider making my coffee at home from now on. I don’t like cheap coffee. I make coffee only at home!